London Daily Photo: Cup of Coffee, anyone? Take note of the wooden sculpture in the window - more about the sculptor soon. Comments on "Cup of Coffee, anyone?" 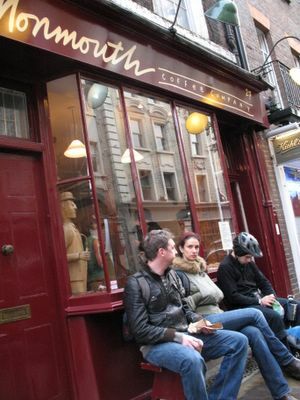 A branch of Monmouth Coffee House is in Borough Market. Worth a visit as well and the smell is as good as the one in Covent Garden.